Artists, have you ever stepped back and looked at the whole range of your work, and noticed something, a common thread or theme, that you hadn't been aware of before? Today I'm thinking out loud about a trend I've noticed in my own work. Lately I've been purging my studio, pulling out old work and deciding what to do with it, and I've noticed a persistent habit or feature in my compositions that I wasn't fully aware of until now. I seem to have a thing for margins and borders. 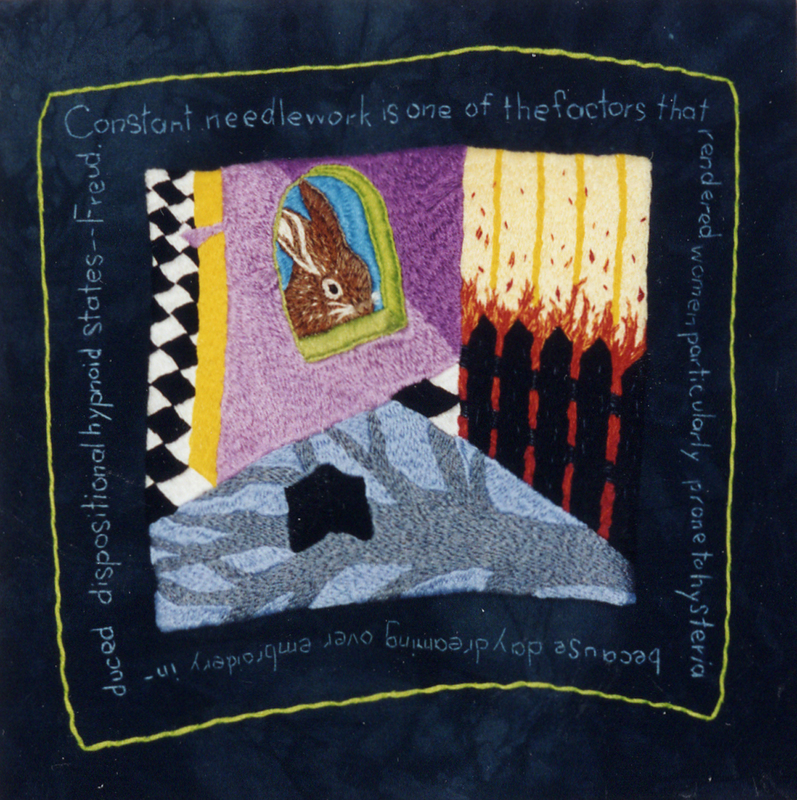 (c) Molly Elkind, Freud's Diagnosis, hand embroidery, c. 1995. 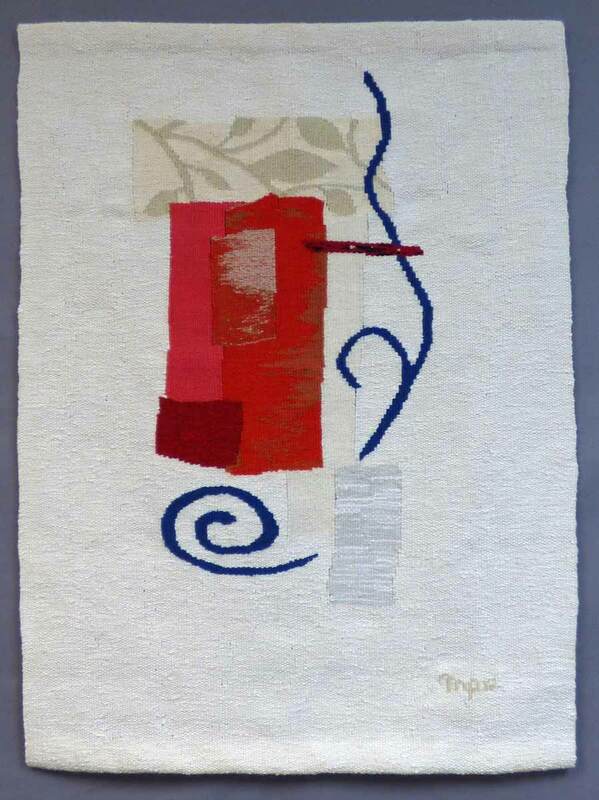 I did this embroidery as a surface design class assignment at the University of Louisville. The dense stitching distorted the cotton ground, so I decided to exploit the mistake by stitching an off-kilter frame around the piece. I still love the quotation, attributed to Freud: "Constant needlework is one of the factors that rendered women particularly prone to hysteria because daydreaming over embroidery induced dispositional hypnoid states." 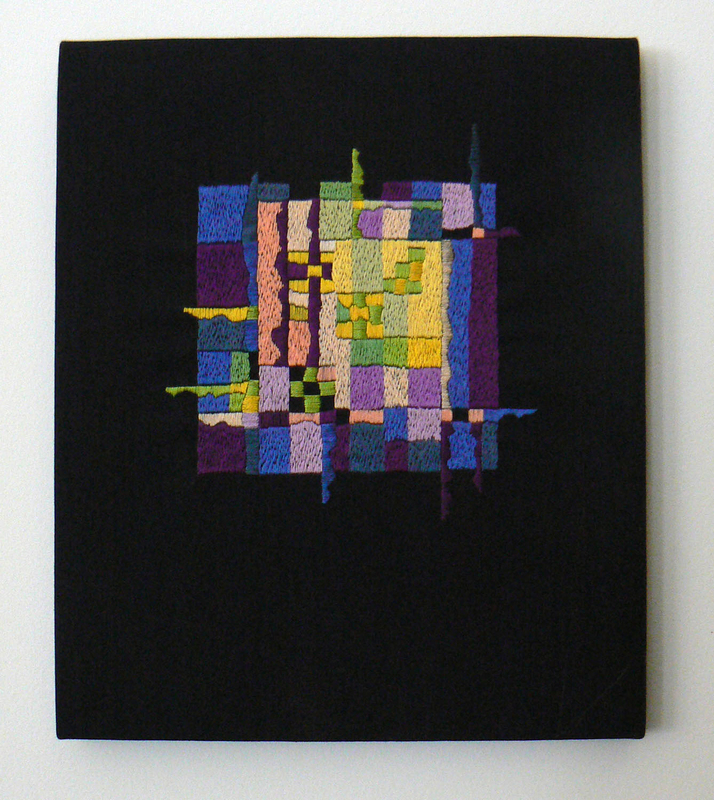 This embroidery was inspired by Amish quilts. 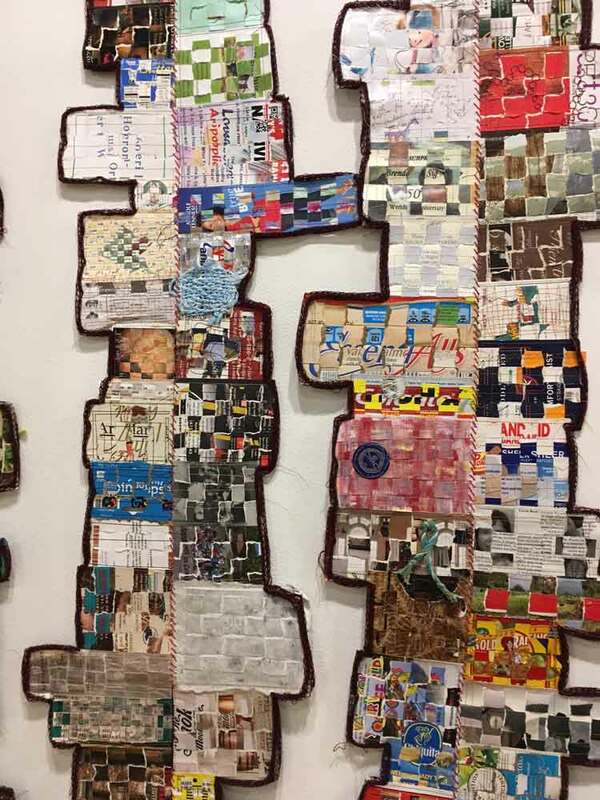 As I worked I imagined what might result if those masterful quilters could break free of their carefully circumscribed lives and 20-stitches-per-inch standards, stitching irregular shapes that break the confines of the square and disrupt traditional patterns. 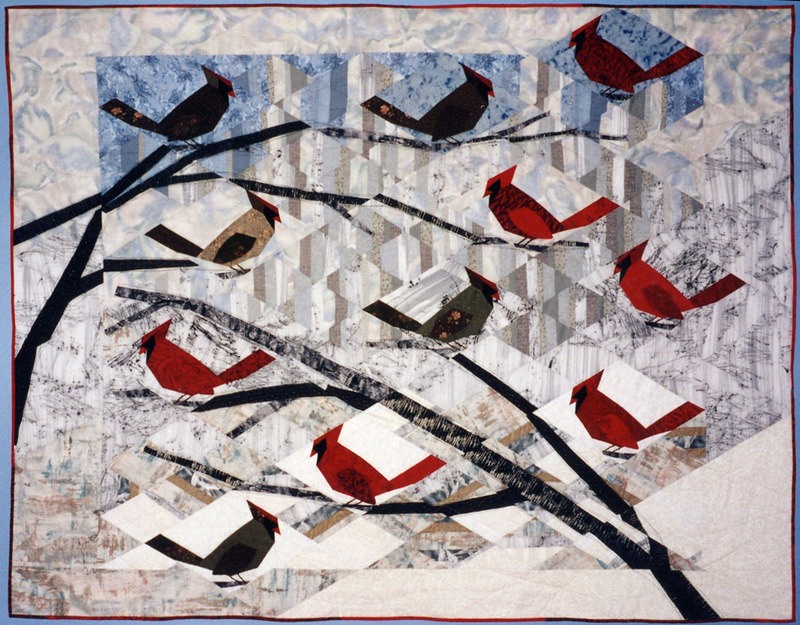 Here's one of my first self-designed quilts. 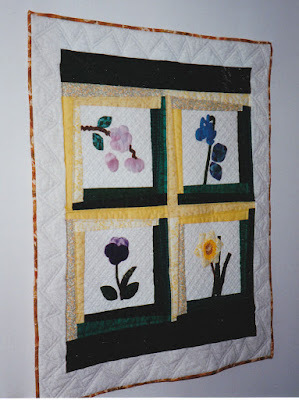 It may be hard to make out in the photo below, but I chose to quilt the border with an irregular zigzag line, perhaps echoing the off-kilter log cabin frames around each flower, rather than a traditional feather or other curvilinear motif. 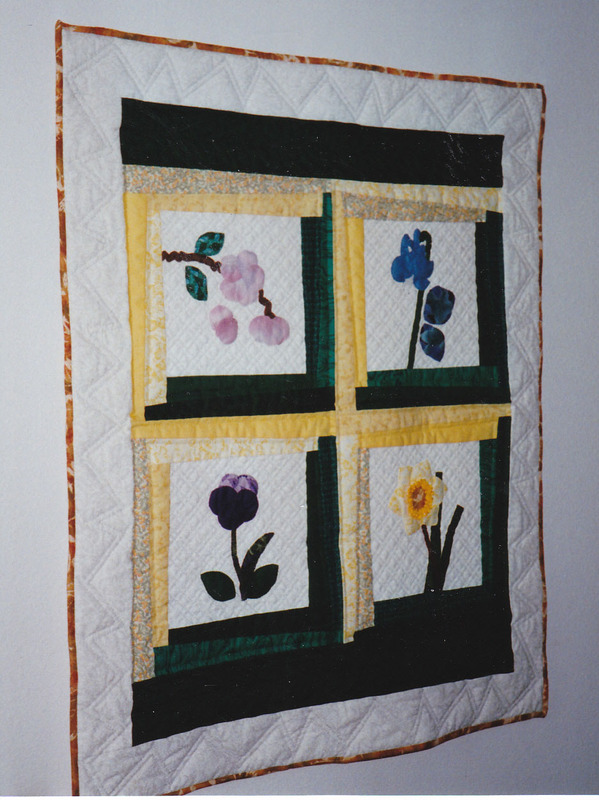 (c) Molly Elkind, Applique Flowers, quilt, hand applique and quilting, machine piecing, 1993. 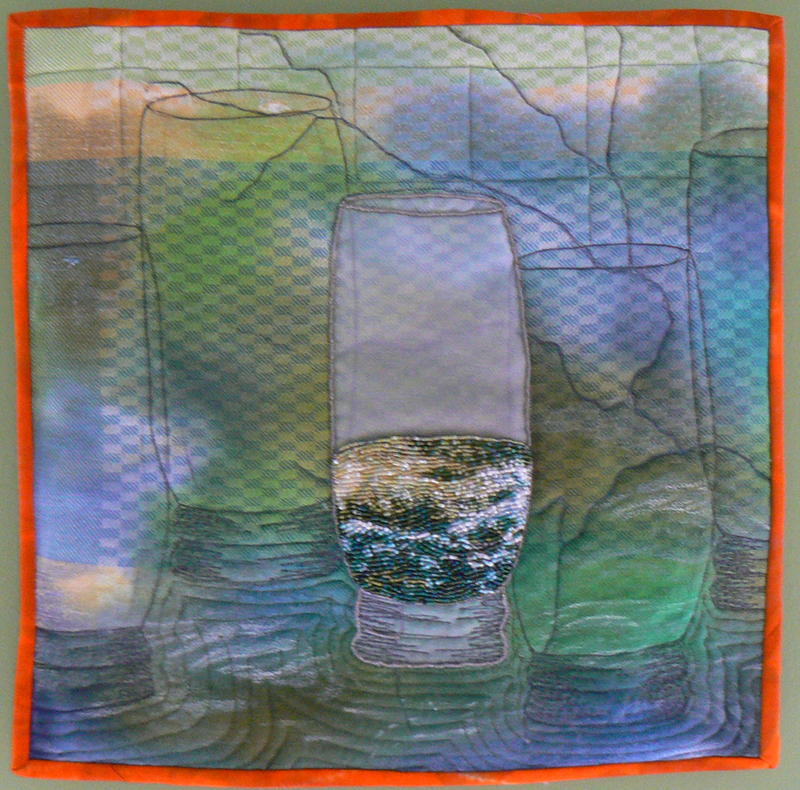 Here's another early quilt, in which the border comes and goes, like a lost-and-found line in drawing. I borrowed this idea from master quilter Ruth McDowell. 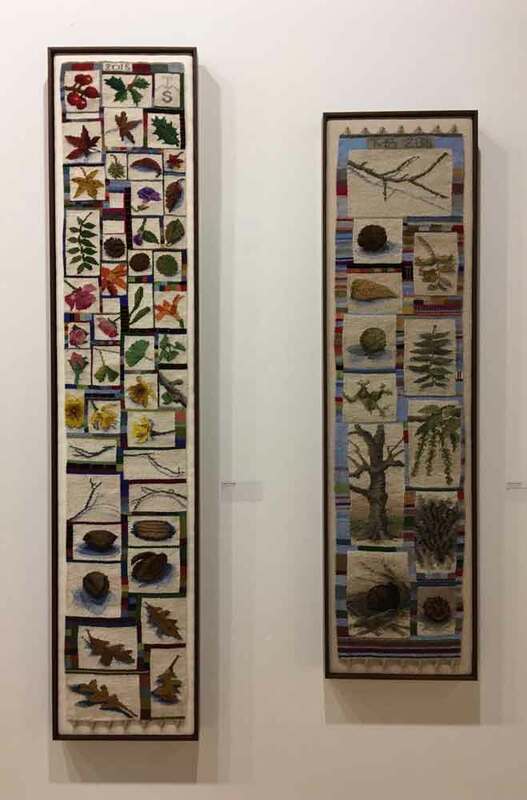 Below are two pieces from my Ways of Looking at Dodd Creek series of small mixed media quilt/collages. In this one I definitely see the wide border around a central image that continues to interest me today. (c) Molly Elkind, Ways of Looking at Dodd Creek #5, 2007. 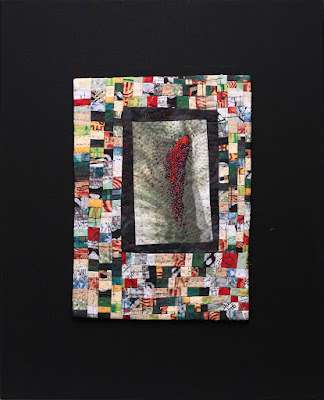 Mixed media, 22" x 18"
And in this piece, I couldn't resist adding a binding in an unexpected color. (c) Molly Elkind, Ways of Looking at Dodd Creek #6, 2008. Mixed media, 14" x 14"
The other series is inspired by the format, composition and colors of medieval illuminated manuscripts. 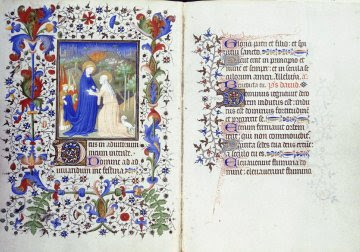 I love the way these manuscripts combine text and image in a gorgeous whole, a patterned, brilliantly colored, decorative surface that carries meaning. . .meaning that most of us can't decipher anymore. I especially like the way some manuscript pages leave spacious margins around an area of dense text in the center of the page. Sometimes these margins are filled with decorative patterns, sometimes not. My tapestry Red Letter Day explored this composition in an abstract way. 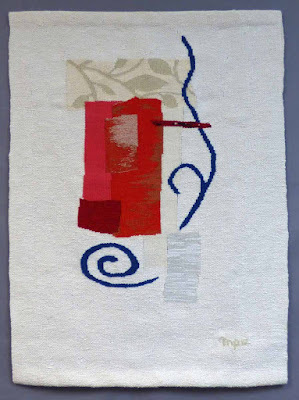 (c) Molly Elkind, Red Letter Day, handwoven tapestry, 2016.
cotton, wool, synthetic. 35.5" x 26"
I'm going to continue to play with this theme as I work on more tapestries inspired by centers and margins. Hey, all you artists and makers out there! Have you ever pulled out your work and looked at the whole range of it? Did you discover anything surprising? 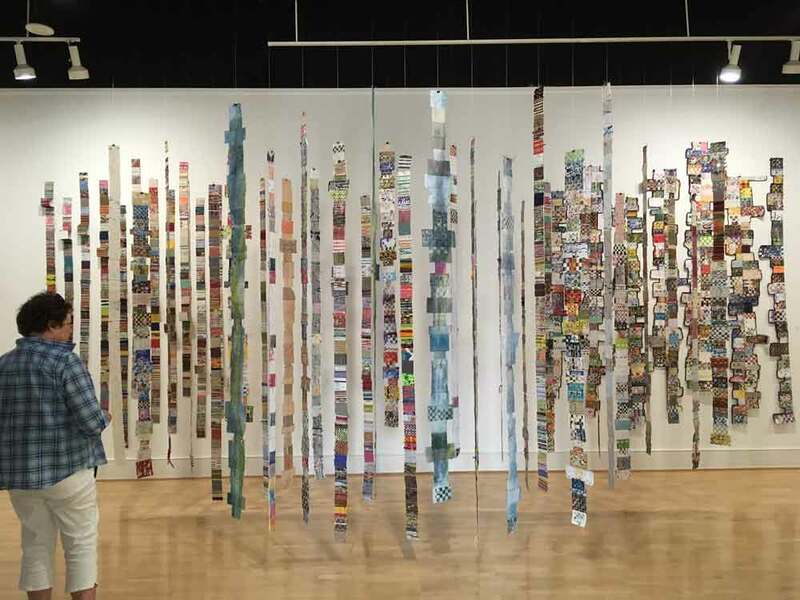 I had the pleasure of viewing an exhibit of time-related tapestries last week in Athens, Georgia at the Lyndon House Arts Center. 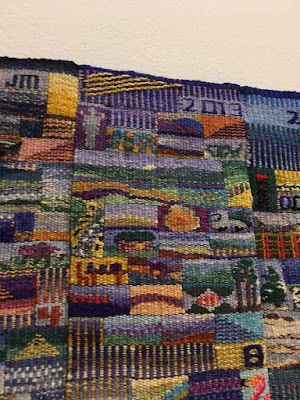 A number of tapestry weavers have been making tapestry diaries and other pieces exploring the passage of time, and this exhibit highlights those weavings. As always, it was great to see work in person that I had previously seen online or in printed publications. You can appreciate the techniques, the textures, the physical presence of a weaving so much better in person. 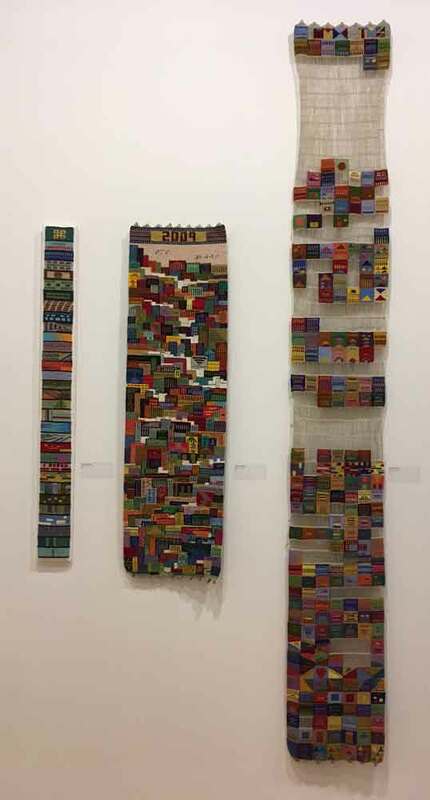 Perhaps the best surprise though was the sheer variety of approaches that is possible with what seems like a fairly straightforward idea: mark the passage of time by weaving. If you are interested in tapestry or in a daily practice of any kind, do yourself a favor and go see the show. It's up through July 29, 2017. And if you want to know how to get started on your own diary, read to the very end of this post for an exciting announcement! Geri Forkner's daily weavings in foreground; Kathy Spoering's calendar pieces in background. 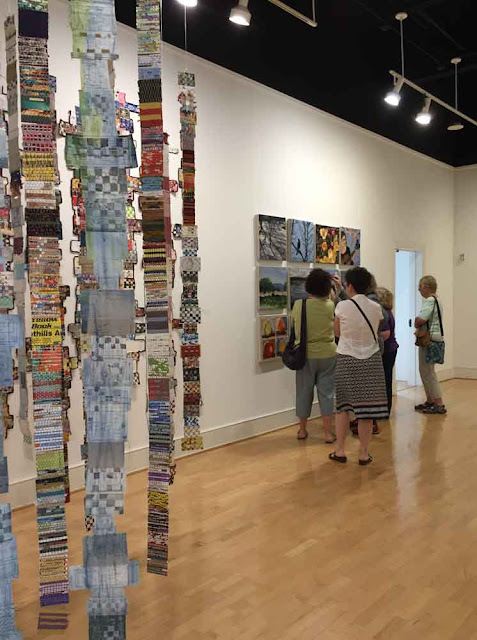 The pieces were beautifully installed in a spacious gallery. Each artist's work was hung together so works could be compared from year to year. Geri Forkner has been doing daily weavings incorporating found objects and non-traditional materials since 2005! 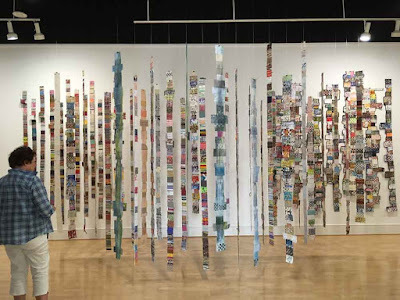 Her long narrow strips were hung from the ceiling and on the wall behind, making an visually rich environment that invited viewers to walk through and among them, studying individual details. One of my favorite details was the comb which formed a miniature loom! 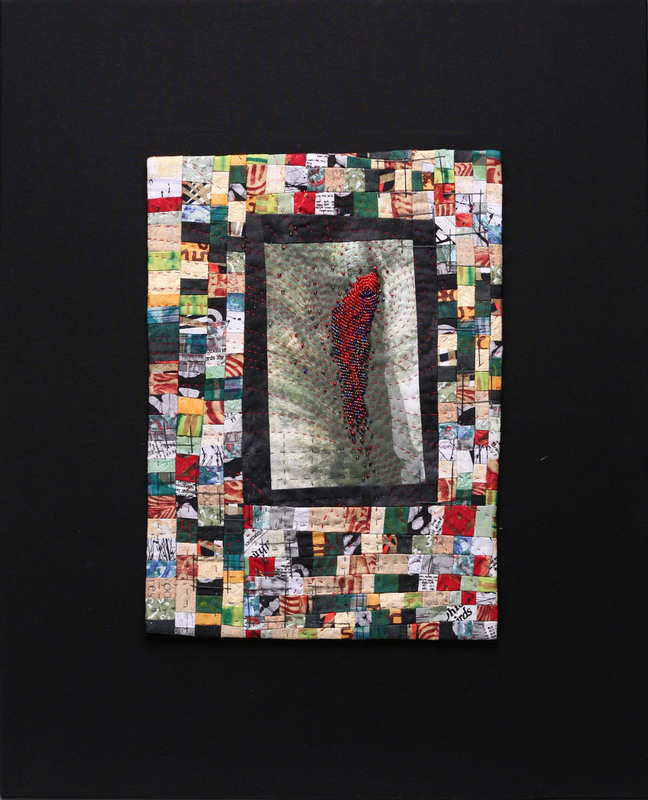 Several artists have taken the diary aspect literally, weaving a small defined bit each day. 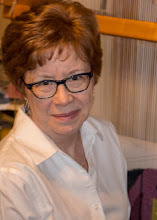 Every artist sets up her own rules of the game, deciding in advance how colors will be chosen, what techniques will be used, and the overall size of the finished piece or pieces. 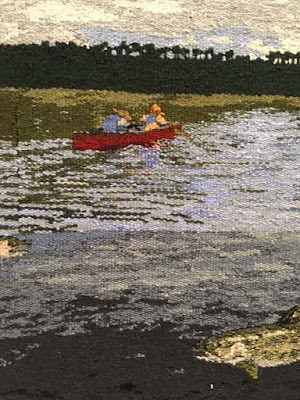 Janet Austin, Janette Meetze, and Tommye Scanlin have all created traditional wool (or mostly wool), weft-faced woven tapestries this way. Sometimes the month or the date is indicated; sometimes it is not. 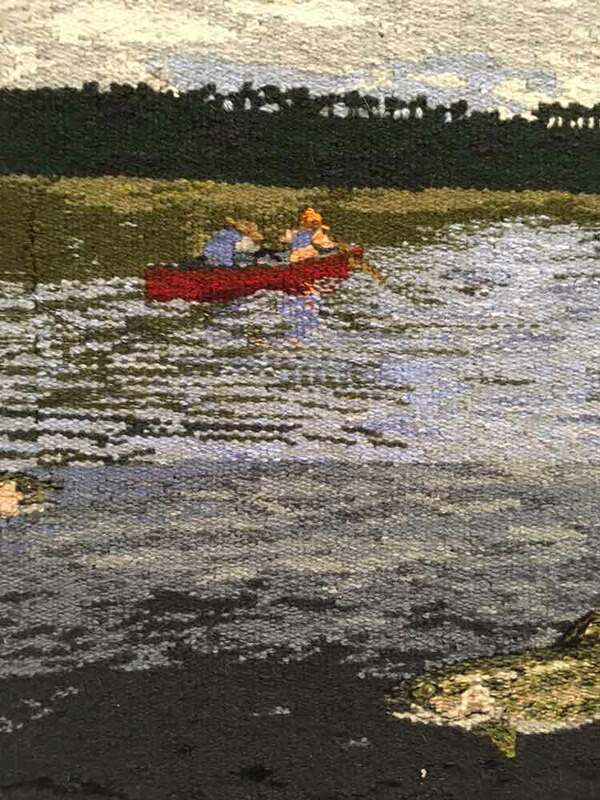 But often events from the artist's life or the larger world make an appearance in the weaving. The daily inventiveness of these artists' approach really impressed me. And their craftsmanship inspires me as I continue to refine my own technique. 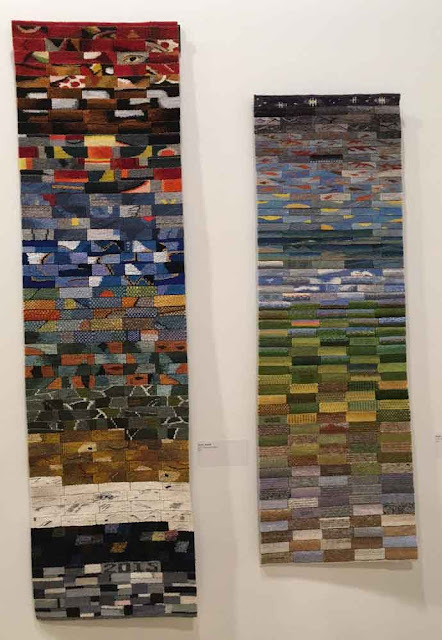 Janet Austin, Tapestry Diaries 2015 (left) and 2016. Apologies for the askew photo. I love the way Janet Austin has outlined each day with a thin black line, setting it off and alluding, perhaps, to the calendar format. And each day is a delightful miniature in itself. Janette Meetze made her 2013 diary in three panels, with each day a distinct and detailed rectangle. 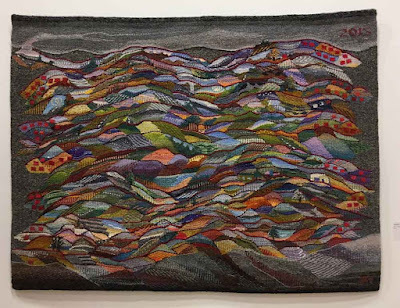 But for 2015 Janette adopted a more fluid approach, in which the days flow into each other, and the journey through the year is like a hike through the hills. Red squares on the sides indicate the months. 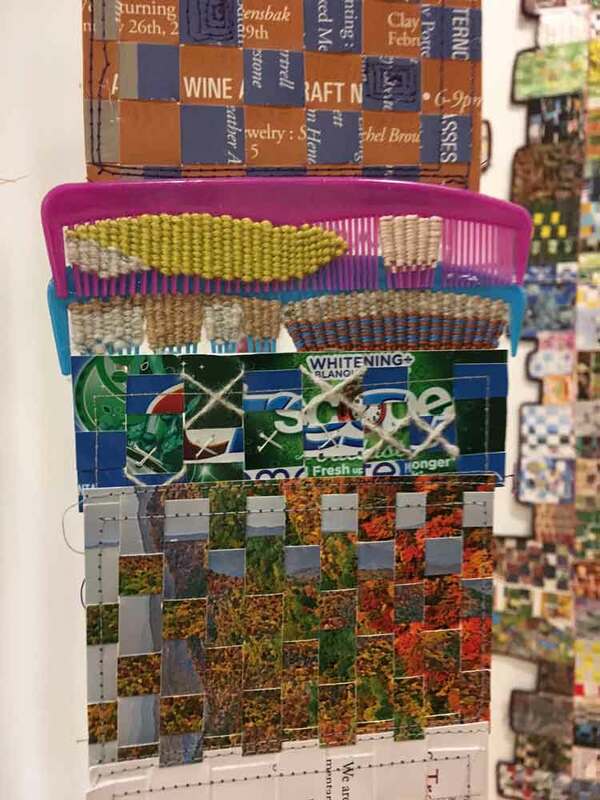 It was especially interesting to see how several artists' approach to the project changed over the years of their practice. Tommye Scanlin has been weaving diaries since 2008. You can see the evolution of her pieces below. A weaver can choose to weave one loooooong piece, or several smaller pieces. She can choose to leave the warps unwoven when she is away from the loom, as Tommye has done in Year Two 2010 below. In another year, she chose to weave a solid "filler" color for those days. 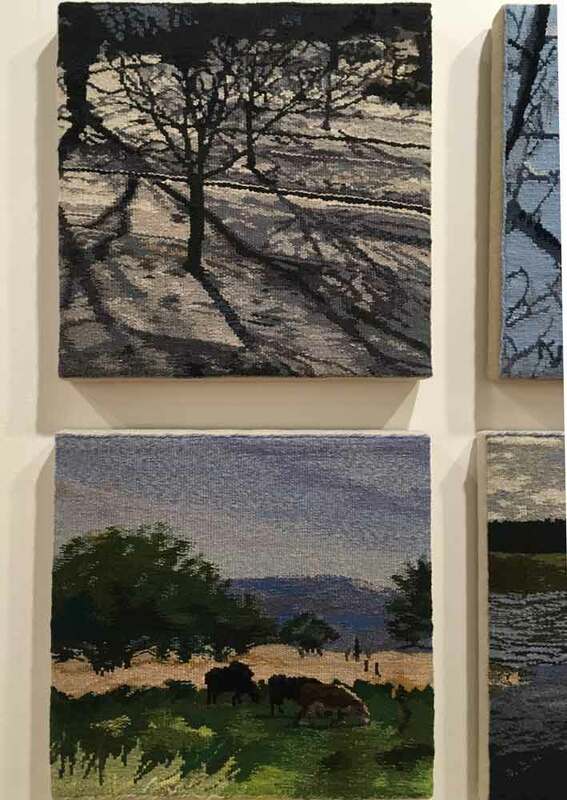 For the past few years, Tommye has woven a small image related to the season for each month, and has indicated the passage of each day with squares and rectangles that surround each month's image. As long as each month's image and surrounding shapes are completed by month's end, it's all good. 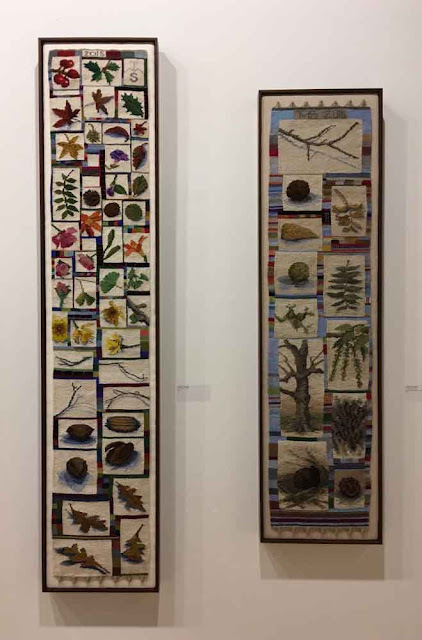 Kathy Spoering completed a calendar series, weaving a pictorial tapestry for each month of the year. As I understand it from her blog, this was a project requiring several years' work, and the detailed imagery and thoughtful designs attest to that. Finally, Rebecca Mezoff took yet another approach to the theme of time. 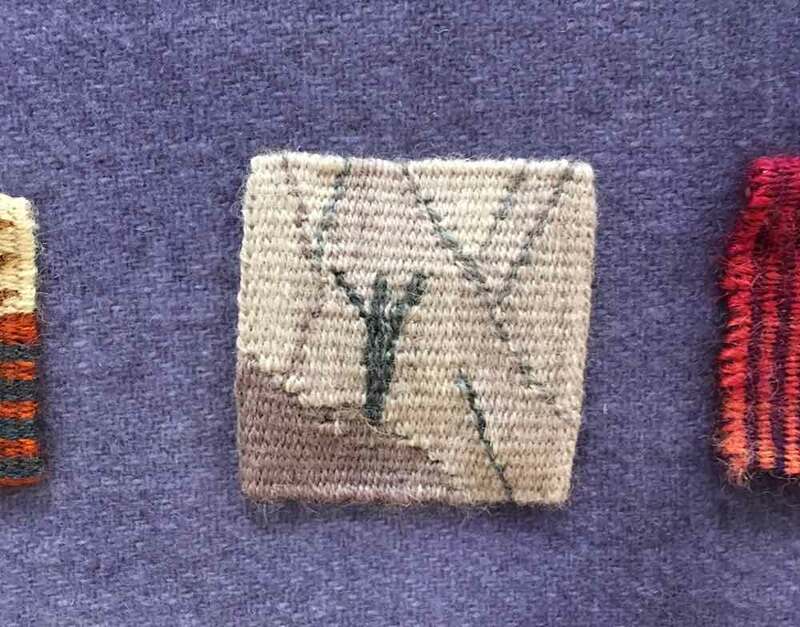 In a recent artists' residency at Petrified Forest National Park, she took her small Hokett loom outside each day and wove a 2" square piece in response to the landscape around her. 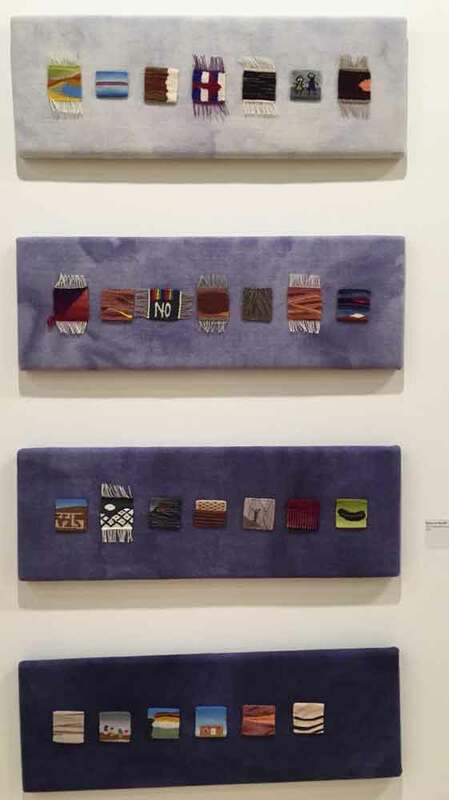 She mounted several of these pieces together on fabric-covered stretchers. These intimate pieces invite the viewer to come in close to appreciate the details. 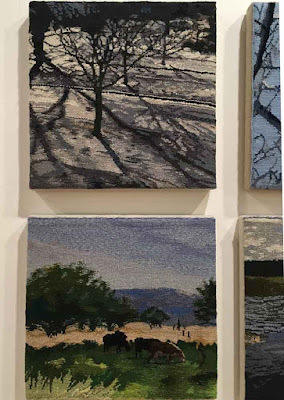 Rebecca has also made a book available with photographs of the tapestries in the landscapes that inspired them. I may have to treat myself to this. Research, you know! 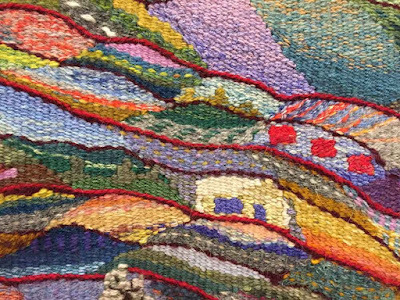 I am mid-way through the second year of my own tapestry diary practice. (Go here to read about last year's diary and my plans for this year's. My most recent post updates you on June 2017's diary.) I am still fascinated by how this daily activity of sitting to weave a bit every morning has been such a spur to creativity--and a way to practice and refine my technique. As I write this it is July 1, and while I have woven the hem of this new month's piece, I still don't know what my approach will be. But tomorrow morning, I will find out. Stay tuned. P.S. 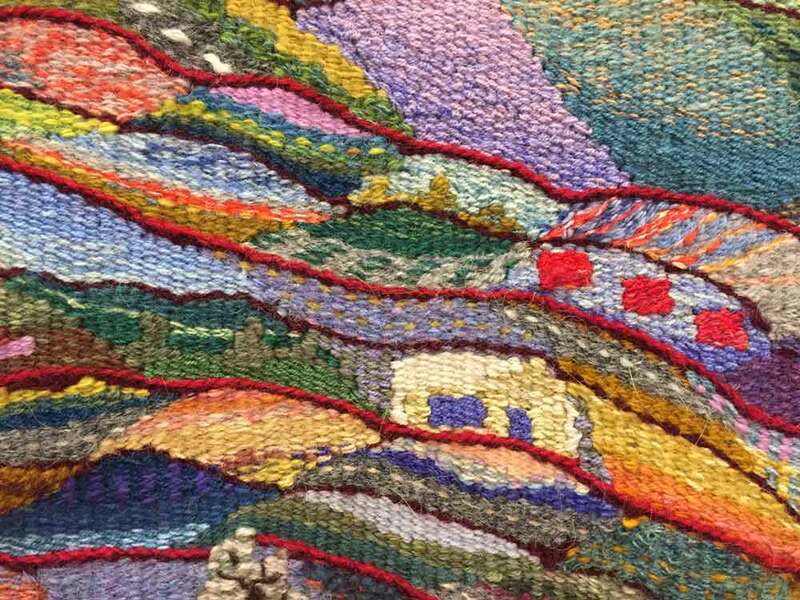 I have just learned that I have been selected to teach "Plan Your Tapestry Diary" at next year's Convergence conference in Reno, Nevada. 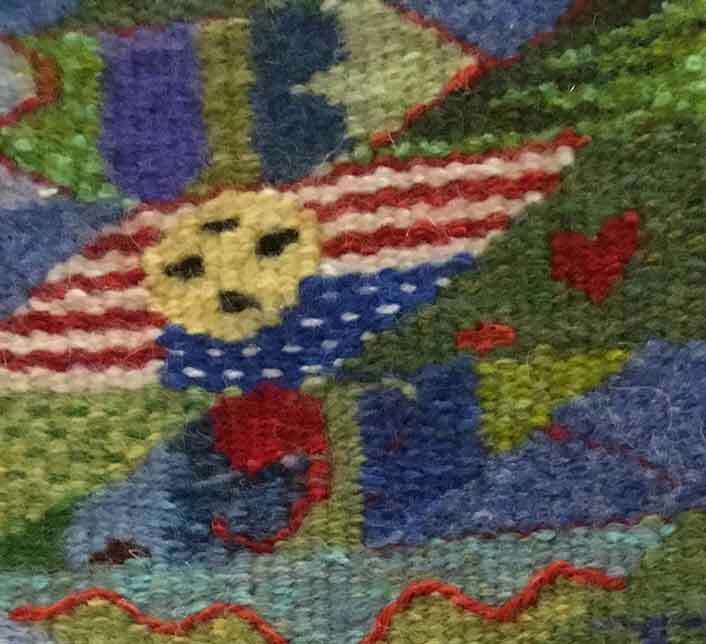 If you're excited by the possibilities of any kind of time-related weaving (and isn't it all time-related? ), join me there.